1) Cut the Plantain stem into tiny cubes. Cutting the Plantain stem is a little tricky. Cut them into thin rounds first and try to pull out the fiber as much as you can with the help of a knife and later cut them to tiny cubes. 2) Put this in salt water and leave it in that salt water for sometime. 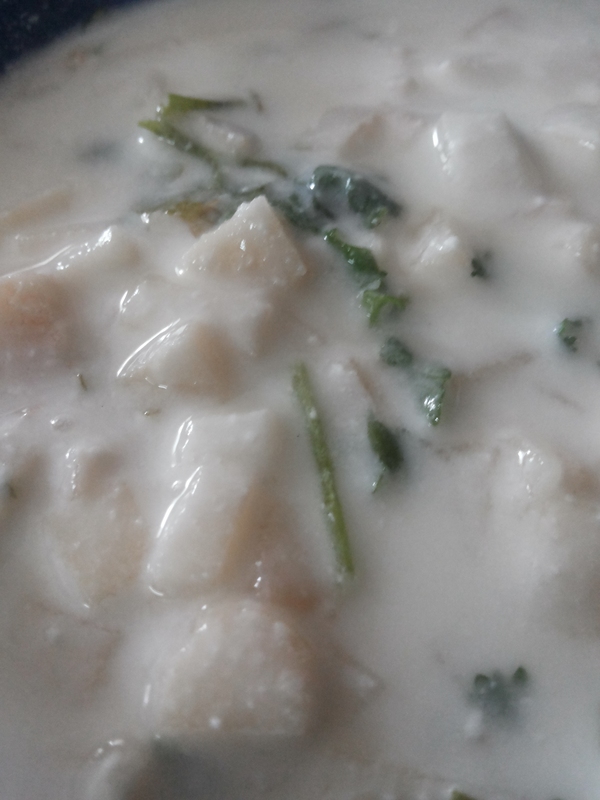 3) Take a bowl of curd, remove the plantain stem cubes from salt water and put them in the curd. Add the green chili, chopped coriander leaves and season with salt. Let it soak for a while (30mins+) before it is served. A potassium rich food with high fiber content and it has many other amazing health benefits. Most people include banana in their daily diet, but very few have ever thought of including banana stem. The banana stem has many nutritive and health benefits. The stem is usually thrown away once the fruit is cut from the plant. So next time if you happen to find one, think of including it in your menu. Here are some good health reasons why banana stem must be part and parcel of your diet at least on occasions. It is a diuretic and helps detoxify the body. Some believe that banana stem can prevent and treat kidney stones. This is fact under study and the effectiveness has not been proven by the western world. Slicing banana stem for dishes might be hard work, but it provides unmatchable health benefits.Its a cooling agent to our body , so use it weekly twice is recommended. This entry was posted in Food, Healthy Food. Bookmark the permalink.